From Goodreads: From the fantastic author of The Lonely Hearts Club and Prom & Prejudice comes a story of all the drama and comedy of four friends who grow into themselves at a performing arts high school. I really loved the sound of this one – it kind of reminded me of the TV series Fame which I was a massive fan of when I was younger. And having enjoyed Elizabeth Eulberg’s previous novels I was sure I was in for a fun read! In Take a Bow we get four characters points of view: Carter, Sophie, Emme and Ethan. While I hated Sophie pretty much from the start I really enjoyed getting the other points of view. I really liked Emme straight away – she’s very nice and just learning to stand up for herself. She doesn’t realise just how talented she is but progressively gets more confident as the story goes along. Ethan is awesome – the kind of nice but flawed character I love. He seems very good at messing things up! But I loved the way he is always there for Emme. How the whole band were there for each other – I loved Jack and Ben too! Carter was also a really interesting character – someone who seems to have it all but actually wants something completely different. It was also refreshing to come across a character that didn’t particularly want fame – or have any delusions about his talent! I really enjoyed his story arch. My favourite element was the love story and I’m pleased that Emme and Ethan are such good friends. I was a bit disappointed that Emme doesn’t really ‘go there’ in her POV but adored Ethan’s narration when talking about Emme. And of course, I loved the ending! I really enjoying Elizabeth Eulberg’s writing and look forward to seeing what she writes next. 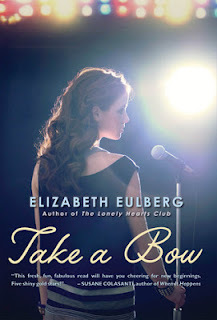 I really like both the books by Elizabeth Eulberg that I've read. They're very fun and sweet. I look forward to reading this one soon! I really liked Carter-seeing him look for something new, something fulfilling was great and I loved that he didn't have a terrifying stage mom. I really want to read Take a Bow. It sounds like the kind of book I'd really enjoy. Great review! I've seen this book around, but didn't feel compelled to pick it up. Maybe I should.